Gordon Brown, when prime minister, made unsuccessful appeals to the US government that computer hacker Gary McKinnon be allowed to serve any sentence in the UK, according to new files revealed by WikiLeaks. 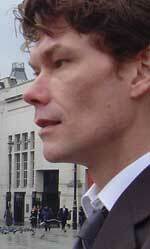 Gordon Brown, when prime minister, made a direct appeal to the US government that computer hacker Gary McKinnon be allowed to serve any sentence in the UK, according to new files revealed by WikiLeaks. The files, obtained by the Guardian newspaper, show that Brown made a face-to-face attempt to strike a deal with the US ambassador in London in August 2009, but that he was was spurned by the Obama administration. According to a leaked cable sent by the US ambassador in the UK, Louis Susman, to the secretary of state, Hillary Clinton, Brown proposed a deal that "McKinnon plead guilty, make a statement of contrition, but serve any sentence of incarceration in the UK". The message said Brown had cited "deep public concern that McKinnon, with his medical condition, would commit suicide or suffer injury if imprisoned in a US facility". The ambassador however said he was unsuccessful in raising Brown's proposal with president Obama's attorney general in Washington. McKinnon continues to fight an extradition order to the US to face hacking charges, which claim he caused millions of dollars of damage to US government and military computer systems. He says he was searching for concealed evidence of UFOs. The new Cameron government and the US authorities were reported in the summer to be considering a similar deal to the one rejected that would allow McKinnon, if convicted, to serve his entire sentence in the UK. The news emerged after the prime minister raised the issue directly with Obama during an official visit to the White House. Under the reported proposal, McKinnon could be guaranteed bail before facing a US trial. If he was found guilty, he would then be immediately transferred to the UK. McKinnon has been diagnosed with Asperger’s syndrome, a form of autism. His mother has warned he could become suicidal if extradited, saying he would not cope in a maximum-security US prison.